Who is the best James Bond? If you’ve ever had that discussion, you might enjoy one of the Bond-flavoured podcasts on the iTunes feed (other podcast delivery systems are available etc). Some are hosted by Bond uber-fans who love to geek out over trivia, while others are less intense and more accessible to the casual viewer/listener. To help you find the most palatable James Bond podcast for you, here are mini-reviews of some of your options. Note 1 – On a smartphone, swipe left and right to see more entries. Note 2 – This table shows my updated 2017 ranking – most of the text below was written late in 2015. If in doubt, trust the table. A recurrent theme of Bond discussions is that the Bond you grew up with tends to be your favourite. That’s probably true of the first Bond podcast you hear – when you’ve found the right one, why look around for more? The first one for me was James Bonding and I wrote about it in a previous article. Rather than do more work, I’ll just paste the old review here. James Bonding is the Daniel Craig of Bond podcasts – my favourite, but there’s not a lot of it. And like Craig, they’re a bit sick of it. In one of their Spectre discussions they reveal that they’re somewhat burned out from watching and talking about Bond all the time (a state of mind Craig himself has hinted at). They’re going to take a break and recharge their batteries. Fair enough. So if I want to dip into a show that delivers more episodes more often, I’ll be tuning into James Bond Radio. They’ve gone from strength to strength since I first checked them out in 2015. Now (in 2017) they’re more confident, the delivery is better, they have incredible new sections, and they have stellar guests (Roger Moore!). It’s not perfect but after hundreds of hours there’s nothing I really dislike. They did a podcast every day in November 2015 to celebrate the release of Spectre and while I didn’t listen to all of it, I did enjoy the ones I heard. Especially ones where a fan called in and another where they talked about the leaked scripts with Linda Zhu. It’s hard for new Bonds to make their mark on the role, as they’re always being compared to the greats, which is why Daniel Craig is even more impressive. Similarly, the new podcasts I checked out to write this article had an uphill battle since I already had my faves. Bondcast from Shotglass Digital was first on my list. It got off to a strong start with two solid American radioworthy voices. After a few minutes, a Brit joined them. I generally find podcasts more engaging when there are different accents happening so that was a big plus point. The Brit seems to be the Bond nerd of the group, the one who brings the trivia, but it wasn’t obscure stuff no-one would care about – it was relevant and added to the chat. They are going through the movies and reviewing them, and they are taking their sweet time about it. To give an idea of their rate of progress, they put 6 episodes out in the whole of 2014 and haven’t sped up. It’s a strong show with no apparent weakness. I thought I’d dip in for half an hour and get enough of a feel for it to write something, but ended up listening to the whole episode. 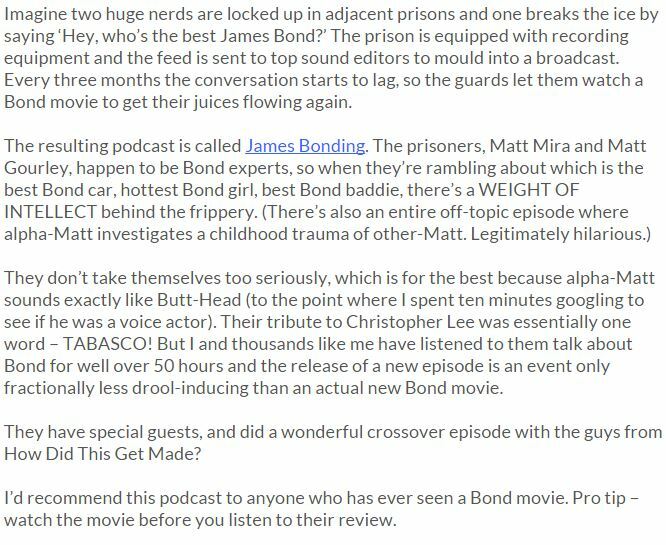 They brought up points I hadn’t heard on other podcasts, which shows just why people love Bond movies – there’s so much to talk about. I got a pretty bad first impression from this one, but in the end I decided I liked it. Thus, it’s the Timothy Dalton of the group. The problem was that in their review of Spectre, one voice was so much quieter than the other voice, and drowned out by the background music they included. It’s a shame because the sequence was actually pretty interesting. The hosts were ‘meeting outside Mi6’ when suddenly there were explosions, crumbling masonry etc. Then it was off ‘to a bar’ for a Martini. Bit of storytelling! A for effort. But ruined by the audio levels being so off. I would have written the podcast off but for a throwaway comment. One said ‘we’ve been podcasting for 9 years.’ Huh? There were podcasts before Serial? What? I set up a MySpace page to promote the podcast. Thanks for the adds, guys! Once I realised the audio problems were a one-off and the guys have been doing this for ages, I relaxed. They are the Roger Moore – they bring class and sophistication to proceedings. Most of their episodes are about how to achieve a Bond-like lifestyle. That means educating their listeners about skydiving, how to play golf like a gentleman, and how to manage your money so you can AFFORD to live like Bond. Great concept, good information, well presented. It’s nicely done. It’s slightly harsh to put Bond(ing) Over Bond: the unOFFICIAL James Bond 007 podcast in this section. But I started with an episode called ‘Oddjob 3 Rankings’. – You Only Live Twice. Can I have a verb, please, Carol? I had a genuinely eye-popping moment of realisation when it hit me that the background hiss was a FAKE DRUM ROLL that someone had sat down and edited into the conversation to add tension to the discussion. Wow. What a mis-step. It was actually unbearable. To be fair to the guys, I checked out another episode – one where they reviewed Moonraker (generally derided as ‘Bond in Space’ and a desperate attempt to cash in on the Star Wars craze). This time, instead of ‘suspense drums’ they spoke over some background musak (which turned out to be the Moonraker theme dirge). Hmm… probably better without anything, as much as I like auditory variety. The hosts are fine. They like talking about Bond and they are likable enough. They have sections like Double-O 30, where they attempt to summarise a movie in 30 seconds. This is good because it forces them to talk faster and with more energy. Breaks up the variety a bit. There’s a section called ‘Distinguished Debauchery’ where they discuss how many Martinis Bond drank, how well he gambled, and so on. There’s a robot ‘spy computer’ voice that introduces each topic, which again, adds a different element to the audio. At a certain point I stop analysing the show and become engrossed in the discussion. Example: they made some interesting points about Roger Moore being a ‘child’s conception of James Bond’. Bond(ing) Over Bond is a bit Brosnan – they’re doing it well but let down by bad CGI and stupid gizmos. 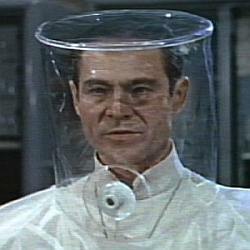 Bond and Beyond is fairly new, with only 8 episodes at the time of writing. The first thing you notice is that the technical quality isn’t great. Their voices sound tinny and background music (e.g. when they’re discussing the best Bond theme) is strangely distorted. There’s nothing wrong with it – if this was the only Bond podcast I’d happily listen. But there’s some very tough competition here. I also had a listen to the Rotten Tomatoes podcast, published by Wolfpop. It’s not specifically about Bond but episode 150 was called Bond… James Bond. It’s good – at first I thought the name was a bait and switch move because they blabbed about other movies for ages. Other movies! The horror! But the second half was a discussion of Spectre with no spoilers. The RT branding came through in that that they often referenced a movie’s score on Rotten Tomatoes (‘It’s got a fresh rating.’ ‘It’s pretty fresh.’). It’s not really about Bond, but a lot of the other episode titles are attractive – ‘Why Are Video Game Movies Always Bad?’ ‘What off-the-radar movies are worth watching?’ One for movie fans in general. Rating – David Niven (good, but not a true Bond). [redacted] – This only ever had [number] episodes, the last of which was in [year]. The world would be a better place if someone deleted it from iTunes. In fact, I’m going to do my part and remove the name and all identifying comments in case some people are intrigued and want to go and listen. Another couple popped up in lists of Bond podcasts but they’ve sunk without trace. Apart from the one I didn’t name above, there aren’t any genuinely bad Bond podcasts still being made. So unless I’ve made a glaring mistake, the best James Bond podcast should be somewhere in this list. No, Mr Bond. I expect you to listen! 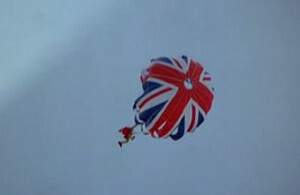 This is an amiable Brit-heavy podcast aiming to gently mock James Bond. The first episode’s sound quality was terrible. The third was better. It’s not super funny, but it’s a different option if none of the ones above hit the spot.